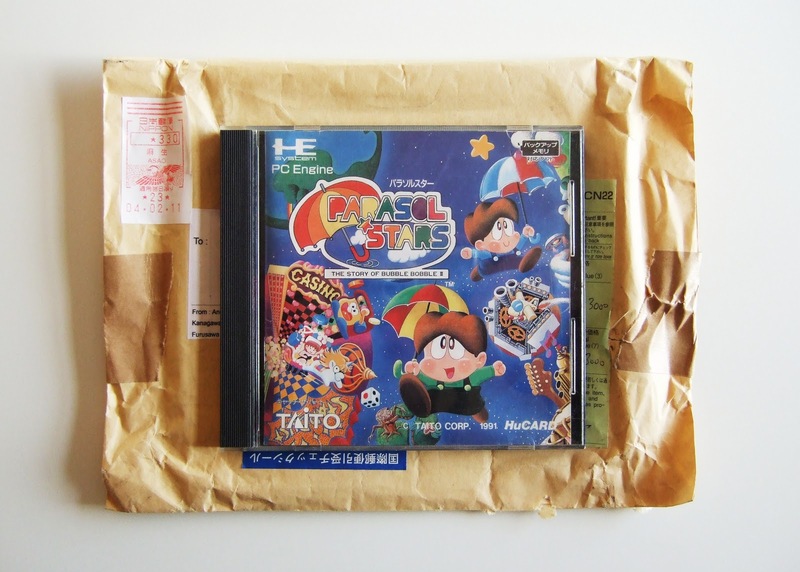 You may or may not know this (I'm pretty sure I've whined about it here a few times, but I may be wrong), but Taito's Parasol Stars has been on my "to buy" list for quite some time. Well, it's not on it anymore. 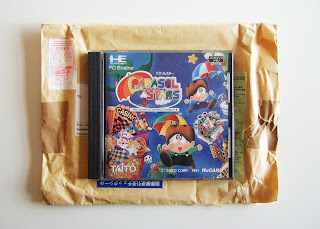 I recently found a cheap-ish copy of this rather precious PC Engine platformer on eBay and promptly snatched it up. It's too bad this game has yet to appear on the Wii Virtual Console (or on the PlayStation Store's PC Engine Archives or the iPhone's PC Engine GameBox services), as it definitely deserves a wider audience. Yeah...after hearing you talk about it so much, I'm feeling left out for not being able to play it. Super cool for you, though! Let us know if it's everything you dreamed it would be! I've played this game many times before I picked up this particular copy, so I knew what to expect. I actually owned the US version of it back in the day (when I owned a TG-16) and I've also played it via emulation quite a bit. Still, it's nice to own it again. I think you'd definitely like it, BTW. I wouldn't say it's as good as either Bubble Bobble or Rainbow Islands, but it's still a pretty great game. Very cute and colorful and fun. I'm a little confused. I have Rainbow Islands for the Famicom. Its got more or less the same cover art as this one. Are they the same game or different? I haven't actually played it yet, had some trouble loading the cart. I'm curious though. I'm so glad I get to let loose my Bubble Bobble geekery on you, Sean! All of these games play fairly differently. In BB, you control a dinosaur who blows bubbles at enemies within a completely contained, single-screened stage. In Rainbow Islands, you control the human forms of those dinosaurs, and this time your weapon is a rainbow (which also can be used as a stair/step). Oh, and stages scroll vertically -- like some of the stages in Kid Icarus. Finally, in Parasol Stars, you once again control the human forms of the dinosaurs from Bubble Bobble, but this time your weapon is an umbrella, which you use to grab onto enemies and fling them across each stage (some of which are single-screened and some of which scroll horizontally). If I were to grade them, I'd say Bubble Bubble is the best, followed closely by Rainbow Islands and then Parasol Stars at the end. That's not to say Parasol Stars is a bad game -- on the contrary, it's loads of fun. It's just not as great as its predecessors. One last thing: The Famicom version of Rainbow Islands is decidedly "meh," in my opinion. The only good versions of the game are the arcade original and the PC Engine CD version. Good to know, all. And...is it just me, or did you change the format of the title of this entry a few times? Uh, first I have to correct myself and tell Sean (and anyone else who reads this post) that the game he has is the SECOND game in the Bubble Bobble series, not the third. Doh. 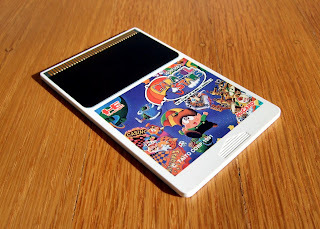 Hmmmm....I might have to go track down that PC Engine version! Sean: Do you have the CD-ROM attachment for the PC Engine? If so, I'd definitely recommend tracking down a copy of Rainbow Islands for that system. I also recommend tracking down a copy of Parasol Stars for the regular PCE -- especially if you like this kind of one-screen, arcade-style game.